Not long after they drew criticism for their secret training manual of how to beat people without leaving bodily evidence, city administration officers in China triggered another mass incident. Over 1,000 people protested city administration officers’ violent behavior in southeast China’s Nanjing city the afternoon of May 18. 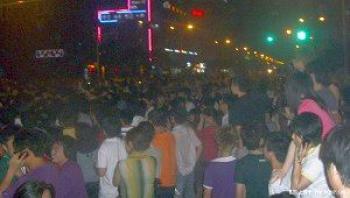 Local traffic was blocked, and the incident ended after anti-riot police dispersed the crowd. 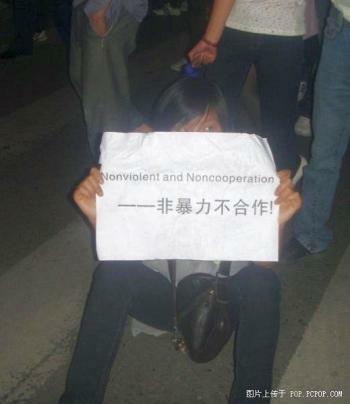 The conflict was triggered when several officers ransacked and beat female university students who setup a vendor’s stall at the night market outside Nanjing University of Aeronautics and Astronautics. Thereafter, more and more students gathered, they surrounded the officers and their vehicle, and requested an apology. However, the incident escalated very fast, both sides engaged in a physical conflict causing several injuries before the anti-riot police arrived on the scene. The student also complained that when the traffic police came, they just drove onto the scene without watching, breaking one student’s leg. According to another witness, about 1,000 students and nearby residents gathered and blocked the local traffic, the incident was escalating because city administration officers refused to apologize, then arrested a few students and attempted to leave the scene in their vehicles. According to Mr. Peng, who has a store front shop close to the scene, the night market often has student vendors, they are just doing business according to regulations. During the incident, the university and the local police sealed off the campus gate to quickly block more students from joining the protest.